The Emerald Ash Borer is an introduced insect pest from Asia that feeds on and kills ash trees. These insects cut off the flow of water and nutrients within the trees by feeding underneath the bark. All species and sizes of ash trees (genus: Fraxinus) are susceptible, except for the mountain ash (Sorbus spp.) which is not a true ash. If a tree has become infested with EAB, mortality will result, usually within 2-3 years. In North America, the beetle was initially discovered in Michigan and southwest Ontario in 2002, and the first infestations in the City of Toronto were detected in 2007 and in York Region in 2008. It is estimated that the City of Toronto will lose nearly all of its 860,000 ash trees to EAB by 2017 -- a number which represents canopy cover over both public and private land in the urban forest. In York Region, it is anticipated that most of the estimated 2,800,000 mature ash trees growing in the area (700,000 of which are found in the urban forest, and 2,100,000 in rural woodlands) will become infested and die within the next ten to fifteen years. If you are a York Region resident and are replacing a dead or dying ash tree, you may qualify for a $100 rebate when planting with our Full Service Tree Planting program. Learn about the York Region Emerald Ash Borer Rebate. How do I know if my ash tree is infested? Trees appear to be thinning at the crown, dead branches and yellowing of leaves. Adults emerge from a D-shaped exit hole between mid May and late June. Bodies are narrow and 8.5 to 14 mm long. Larvae are a creamy white colour with a light brown head. 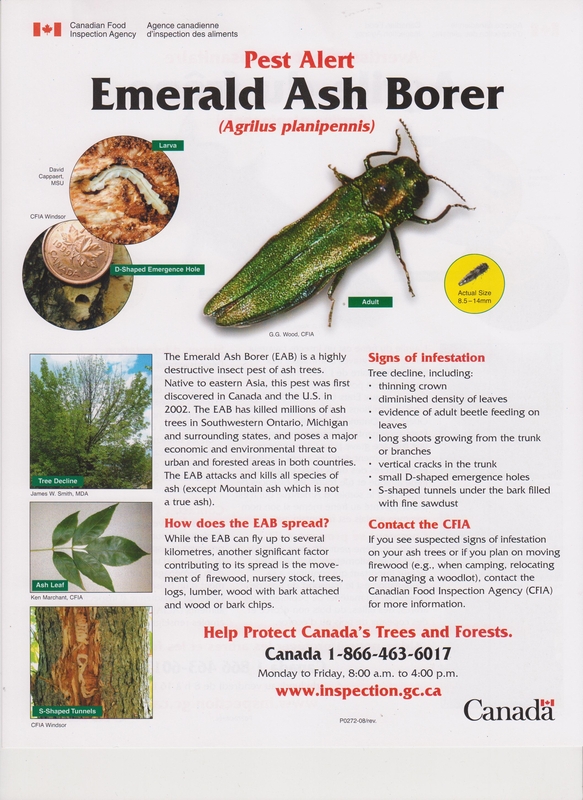 *Please note that other insects, diseases, and problems can demonstrate similar signs and symptoms as those depicted in this guide, and thus is it advisable that you contact a certified arborist to confirm whether or not EAB is present in your tree. While infested ash trees will succumb to the pest, healthy ash trees that are not yet infested or in the very early stages of infestation, can be treated. TreeAzin™, IMA-jet, Confidor 200SL, and ACECAP ® are the only products registered for use in Canada against EAB that in some cases may be able to slow or prevent infestation. Little data is available regarding the effectiveness of Confidor 200SL and ACECAP ®. To learn more about TreeAzin™ or find a licensed applicator in your area, click here. To learn more about IMA-jet or find a licensed applicator in your area, click here. If you live in Toronto and have an ash tree on city-owned property in front of your home, you are allowed to treat it at your own cost. Or you can call 311 to see if the city is able to treat it. If you live in York Region, check with your muncipality for details. If you decide to remove a tree on private property, you will have to incur the cost yourself. There may be removal permits required - check with your municipality. We recommend hiring an arborist certified by the International Society of Arboriculture for any tree work. For a list of certified arborists in your area, visit treesaregood.com or call 1-888-463-2316. In both the City of Toronto and York Region, infested trees that are located on city-owned property in front of homes will be removed by municipal/regional forestry staff and replaced at no cost to homeowners. We encourage everyone who has space to plant new trees to replace those that have been or will be lost to EAB. Even if you haven't personally lost a tree to EAB, planting new trees can help maintain the overall urban forest canopy. LEAF is here to make it easy for you to select and plant the right EAB-resistant native trees for your yard through our subsidized Backyard Tree Planting Program. 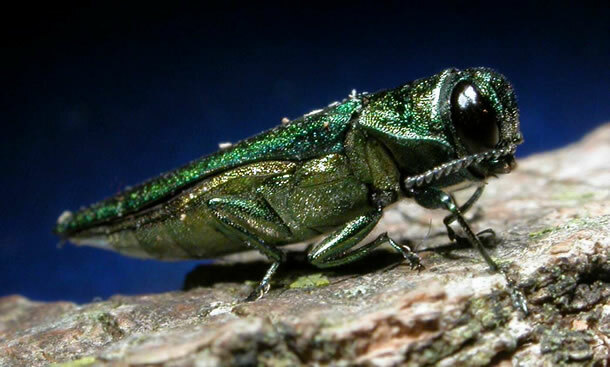 In 2002 the Emerald Ash Borer was first discovered in the province of Ontario, an insect that fed on and devoured the ash tree, a native Ontario tree. In spite of efforts, treatment, and management plans by municipalities and conservation authorities, not all trees could be saved and it is expected millions of trees will vanish, forever altering Ontario’s tree canopy.